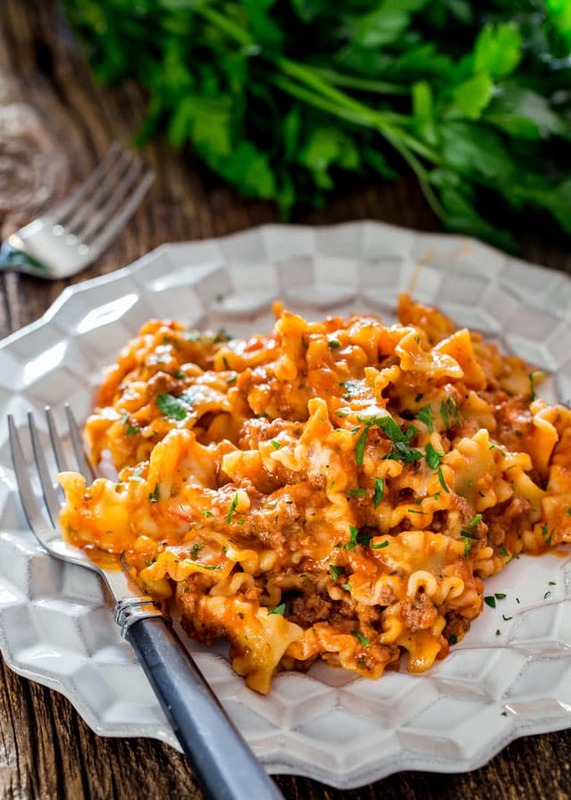 One Pot Hamburger Helper Lasagna – ditch the boxed mix Hamburger Helper and make your own, lasagna style, much healthier and homemade. Comfort food at its finest. OK, I hate to admit this but I actually secretly love the Hamburger Helper meals. When I was in college and I lived on my own, I made them quite a bit. But now that I’m a mature adult, ahem, I am more conscious of what I’m eating and would actually like to know what goes in my food, I make these dishes myself. Last time I went grocery shopping and went down the aisle with all the boxes of Hamburger Helper I saw this lasagna version and I remembered that this was my favorite. Rather than pick up a box, being the food blogger that I am, I decided to make it myself. I’m glad I did, because this could not get any easier. With just a few ingredients, you have comfort food at its finest. 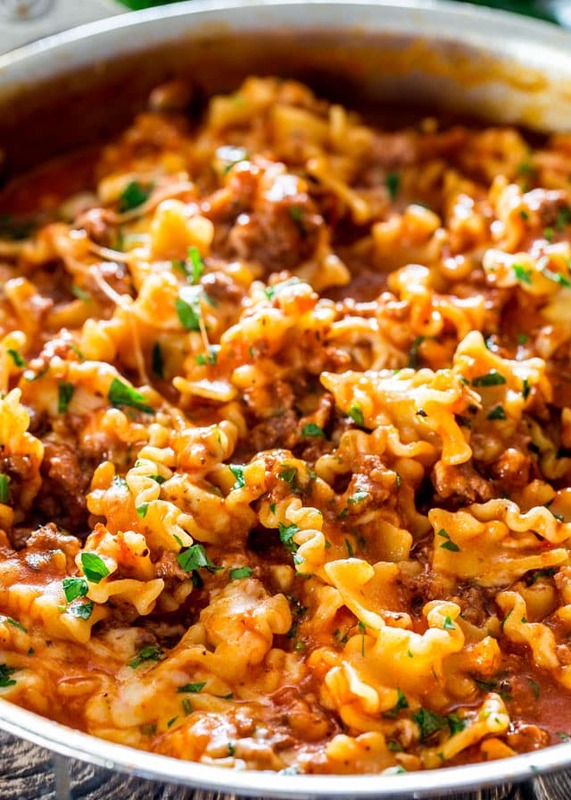 I mean, in case you haven’t figured this out before, I am a pasta lover, so anytime you give me pasta loaded with meat and cheese, I’ll be your best friend for life. No lie! 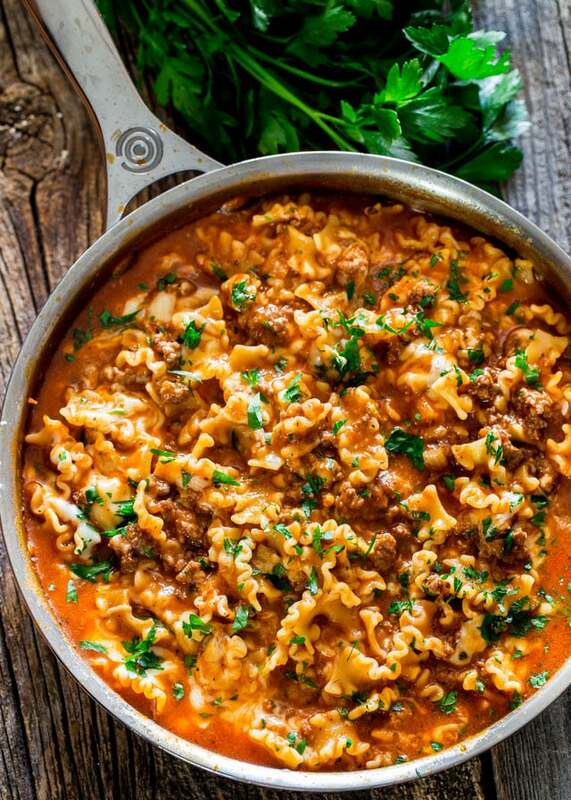 The main ingredients in hamburger helper are pasta, marinara sauce, ground beef and mozzarella cheese. My favorite ingredients ever! The only additions I’ve made are add ingredients that flavor the dish, like onion, garlic, must have garlic, lots of garlic, Italian seasoning, and chicken broth. Here’s the kicker, you can do it all in one pot in 30 minutes or less, cause that’s my thing you know, 30 Minute One Pot Meals. OK, that was a shameless plug, but moving on. I really think I should have been born Italian. And to think I married a man who does not like pasta, how can this be? How can anyone not like pasta? Anyway, I’m not going to contemplate that now because this is the time to talk about this luscious mafalda pasta smothered in marinara sauce with ground beef and laden with mozzarella cheese. This is what my dreams are made of. Yes, what a wonderful world! This is really easy to make. Start by cooking the ground beef in a large skillet until it’s no longer pink and starts to brown a bit. I used extra lean ground beef so I didn’t need to drain any excess fat. Add the chopped onion, garlic and seasonings. Cook for another 3 minutes until the onion softens and becomes translucent. Add the marinara sauce, uncooked pasta, chicken broth and stir everything together. Bring to a boil then turn the heat down. Cook for about 15 minutes or until the past is cooked through. Stir in the cheese and cook for another 30 seconds until the cheese melts. Garnish with parsley if preferred and serve. Seriously though, have you seen anything more beautiful than this. No, don’t answer that! It was a rhetorical question anyway. Back to the lasagna though, I’ve tried to make this as simple as can be and with very few ingredients. 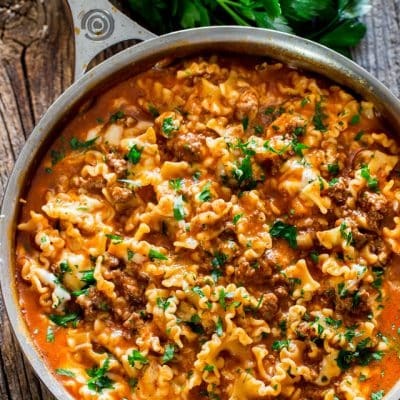 This is the perfect meal to make on a busy night after work and it’s pretty much guaranteed that all family members, especially children, will love this dish, unless of course you have one like my husband around, who doesn’t like pasta. If you’re lucky enough to have leftovers, this would make a great lunch for the next day. Make sure the hamburger helper has come to room temperature completely before proceeding. Store leftovers in an airtight container in the refrigerator for 3 to 4 days. Yes, hamburger helper freezes great. Store in an airtight container in the freezer for 3 to 4 months. 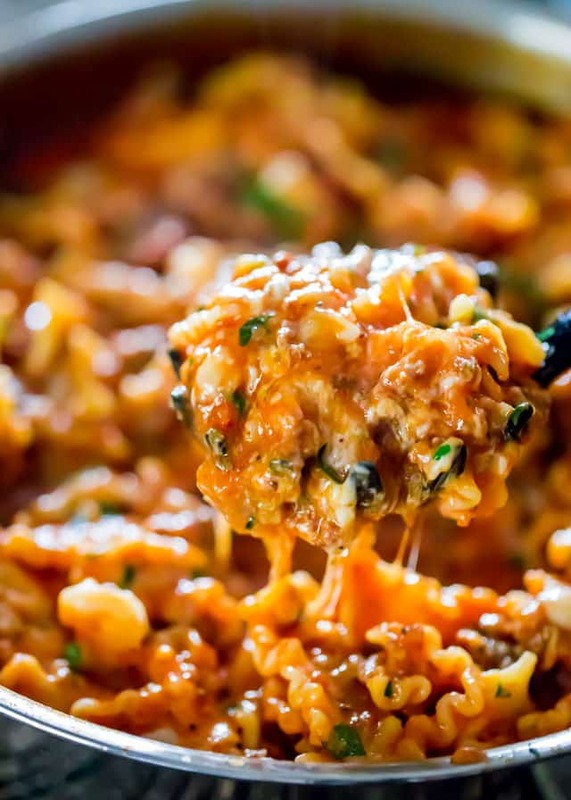 One Pot Hamburger Helper Lasagna - ditch the boxed mix Hamburger Helper and make your own, lasagna style, much healthier and homemade. Comfort food at its finest. In a large skillet cook the ground beef over medium heat until it's no longer pink and starts to brown. Drain off any excess fat, if needed. If using extra lean ground beef there won't be any excess fat to drain. Ad the chopped onion and minced garlic to the skillet and stir. Season with salt and pepper, Italian seasoning and cook until the onion gets soft and translucent, about 3 minutes. Add the marinara sauce, pasta, chicken broth and stir everything together. Bring to a boil then turn the heat down. Cook for about 15 minutes or until the pasta is cooked through, most of the sauce should be absorbed as well. Stir in the cheese and cook for another 30 seconds to a minute until the cheese melts. If you can't find mafalda pasta, you can use any other small type such as farfalle, penne, shells, elbow, etc. You can use ground chicken or turkey to reduce the fat content. Boiled the noodles about half way thru before straining and adding to the marinara mixture. Turned out great!